This morning while brushing my teeth, I was listening to NPR as I always do. I heard the reporter state that the US Department of Interior is moving the Bureau of Land Management from DC to a western location, closer to “people who understand the land." This would appear to be code. The “people” they refer to are not the American public but the very few people who use public lands for private profit. They are the public lands ranchers who run cattle and sheep for nearly nothing on lands owned by all American citizens. The “people” they refer to are oil extractors, gold producers and others who make a profit from lands owned by he American people. family and will now make the ultimate sacrifice. They will end up dying a horrific death in Mexican and Canadian slaughterhouses. 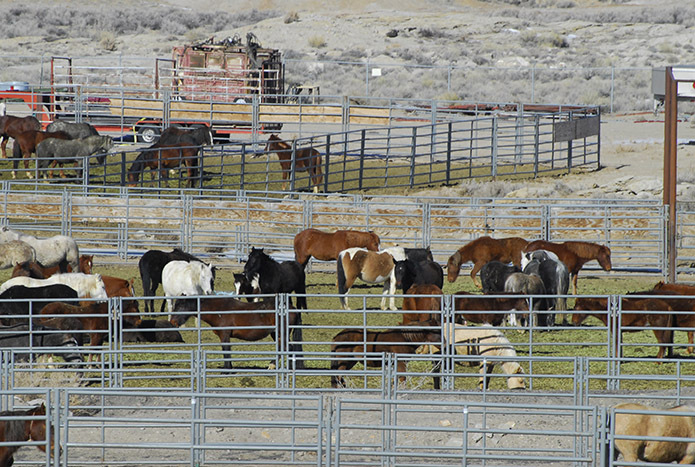 Call your lawmakers and tell them that you are absolutely not okay with the BLM's new policy. This policy allows for the sale of so many animals at a time that it is extremely likely they will end up in slaughterhouses. Share Ginger's message with everyone you can. Share it on your social media pages, and send the link to your local newspapers, radio stations, and television channels. When you click the button below, at the bottom of the webpage there will be several sharing buttons for most social media platforms. Please help us speak out by spreading this message across the U.S. We can't save these wild horses and burros from a lethal fate without your help.